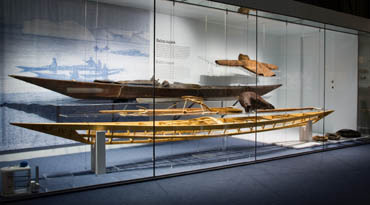 During the winter of 2007, I was asked if I had the opportunity to contribute to the NTNU Museum of Scienceâ€™s Nansen Exhibition, by building a copy of the kayak that belonged to the Sami Samuel Johannesen Balto. Balto took part in Nansens Trans-Greenland expedition in 1888. During the winter of 1888/1889, Nansen and his men built one kayak each, under supervision of local Greenlandic Kayakers from the Nuuk district. 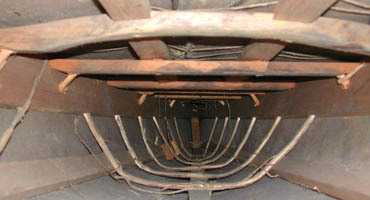 The Museum of science has Baltos original kayak in their collection, and the first thing to do was to survey the original. I went to Trondheim in January, to do the surveying. Apart from Baltos kayak, I took measurements of Baltos paddle and a kayak from the 18.th century from bishop Gunerusâ€™ collection of ethnographic artifacts. It was a delicate task, together with marine archeologist David Tuddenham, to examine these old treasures. Baltos kayak was fairly easy to survey, since it was very well preserved. The Skin was in excellent condition, and the framework was almost intact. I was almost tempted to take it on the water for a small paddling trip! My copy was not to be covered with sealskin. The framework was to be exhibited beside the original, for people to see how the original was constructed. The process of building was fairly easy, and the result was as good as it could be. True to the original, I used pine for all the longitudinal members, and for the ribs I used birch. All parts were nicely fitted together, and finally lashed together with linen thread, just like the original. In the summer of 2007 it was sent by car to Trondheim. The exhibition was named â€œThe west coast of Greenland or dieâ€�, and was officially opened 13. of February 2008. I went to Trondheim for the official opening. The exhibition crew had really done a great job, and had worked till late the last couple of days prior to the opening. I arrived one hour before the opening, and had to make my way through scaffolding and still wet paint! The exhibition was varied and exciting. It takes you on a journey through time from Nansens early years as a scientist, through the expedition planning, crossing Greenland and the journey back home. In Norway, Nansen became extremely popular, and an important part of the process of creating an independent Norwegian nation. Beside the Nansen artifacts, The Museum of Science had exhibited a lot of old Greenlandic ethnographic material. These were primarily from bishop Gunerusâ€™ collection from the mid/early 18. Century. I spent a long time studying these old, and really high quality artifacts. 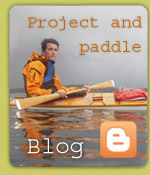 I was, of course anxious to see the kayak that I had built, and I was not disappointed. It was exhibited in a really prime location together with the original and other kayaking gear in a climate controlled showcase. I found the exhibition to be technically very well designed. The information given was good, because it was easily understood and focused on the most important themes. It is an exhibition that I think will speak both to people with little interest in the themes, and to the very interested Nansen â€œfansâ€� like myself. The exhibition crew got lots of positive feedback from the people represented at the opening. A huge applaus from me too! If Nansen, Balto and the others, now passed away, could have looked down from their eternal hunting grounds, I think they would have approved too, and perhaps felt pride about all the attention their work was getting, 120 years and more after their time.